Phil Burton and Adam Wilcox – podium finishers in the Avon Tyres British GT Championship in 2009 and ’10 – are to return to the series this year with their Predator CCTV Ferrari 430 Scuderia, the duo announced today. A new squad will be preparing the Scuderia for Lichfield-domiciled Wilcox, 34, and his Cheshire-based co-driver Burton, Gerry Wainwright Motorsport taking over from Rowan Racing for 2011. Burton and Wilcox are the latest in a long line of British GT competitors to announce their intentions to enliven the grid for 2011. 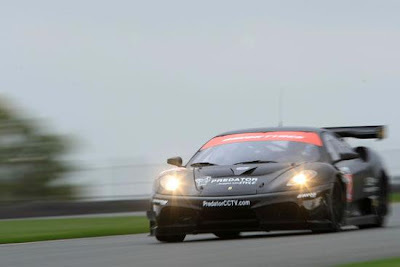 The MTECH team plans a twin-Ferrari attack with race winners Duncan Cameron and Matt Griffin driving one of the squad’s new 458s, while 2009 champions David and Godfrey Jones are set to debut the Mercedes-Benz SLS AMG GT3 in the UK. Other teams to have declared their intentions include reigning champions Trackspeed, which plans to have two Porsche 911 GT3Rs in the pack, and new team Scuderia Vittoria, planning to field a Ferrari 458 and an Ascari KZR1. United Autosports will field two Audi R8 LMS machines. Further exciting announcements about new cars, teams and marques are expected in the coming weeks. The first event on the British GT calendar is the 8 March media day at Silverstone and the following full-day test event. The championship is sponsored by UK tyre manufacturer Avon Tyres and is further supported by Sunoco Racing Fuels, Anglo American Oil Company and OAMPS.